Church's is perhaps the most notable English shoe brand to date. Known for its quality craftsmanship and its use of the world's finest leathers to produce each shoe. Not to mention, the labor intensive operations and eight weeks of craftsmanship using the very finest leathers to produce every single pair of shoes for today's well-dressed gentleman is both legendary and rare. Church's shoes are the premier shoes to experience the finest in comfort, quality and style. And in our ever changing world, these classic English styles form a lasting impression. 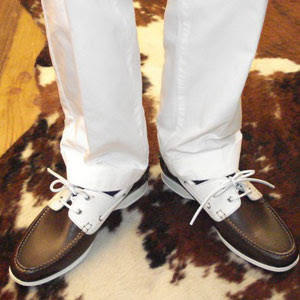 With that said, I wanted to introduce to you purveyors of all things classic-Church's deck shoe. From the handcrafted workmanship, the considered and beautiful detailing of contrasting leathers to the crisp white non-slip sole, this solidly constructed deck shoe is not to be reckoned with.